This new opening comes with a word of caution. The burgs here are addictive. Really. Addictive. But we’ve come up with a solution. Just pull on your loosest pants and the problem no longer exists. Amiright? 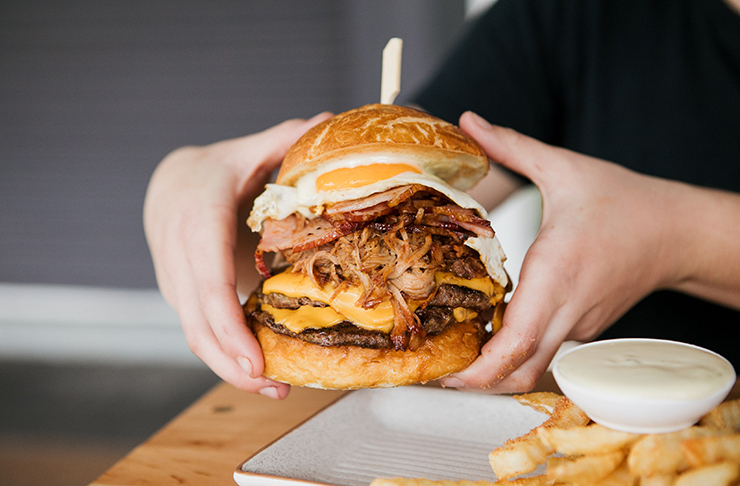 Let us introduce you to DownTown Burgers, the latest burger joint to open in Maroochydore where the burgs are hefty and the cocktails are strong. The name might ring a bell with some of you already, and that’s because these guys also have a thriving sister-store in Nambour. The new Maroochydore joint boasts the same epic noms, snuggly atmosphere and ‘let’s get down to eating’ vibes. Inspired by the world-famous New York burger scene, the food is SO SO GOOD. Our fave is The Big Boy, ‘cause why not? It’s stacked sky high with four patties, cheese whiz, bacon, onion rings, pineapple and eggs. Hell yes! These guys also do a secret burger that changes weekly, a cheap wings night every Tuesday and dessert burgers. Oh yes! Did we also mention the 16 drool-worthy espresso martinis that these guys have available? We love the Long Black, Meringue Martini and also the Dutch Chocolate. They’ve got a dedicated barista who whips them up on the daily. Now that’s something we can cheers to! Lastly, the DownTown crew care about supporting small and local business so much that they are literally put their money where their mouth is by rewarding customers with an order of free chips if they have a receipt from a fellow Ocean Street business produced that day. (Ummm hello, Duporth Book and Record Exchange). How cool is that? So now you might want to think about some exercise. We've rounded up the best hikes on the Sunshine Coast to help you out.